Home > Exploration never ends with Lonely Planet Kids! Lets incorporate learning with fun! 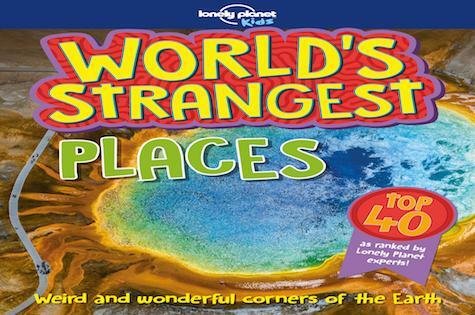 Lonely Planet Kids is excited to introduce its new World’s Strangest series, packed with facts and photos sure to fascinate any child. Unearth totally bizarre features across the planet, from jaw-dropping Places natural and manmade; to Predators known for their deadliness; to Creepy Crawlies such as zombie snails; to Ocean Beasts deep below the surface. Our experts have ranked them from 1 to 40 on the ‘strange-o-meter’, so it’s a breathless race to the end of each book! Lonely Planet Kids aims to inspire, educate and encourage children to be curious about the world. This month, kids can learn with the new World’s Strangest series; whether at home, in school or on the road, every day can be an adventure. Come explore! Lonely Planet Kids – an imprint of the world’s leading travel authority Lonely Planet – published its first book in 2011. Building on parent brand Lonely Planet's 45 years of experience inspiring millions to explore, Lonely Planet Kids encourages the next generation of global citizens to learn about the world around them with engaging books on culture, sociology, geography, nature, history, space and more. Whether at home, in school or on the road, every day can be an adventure. Come explore! Find out more on lonelyplanetkids.com, and join us on Facebook (facebook.com/lpkidstravel), Twitter (@lpkids) and PopJam (@lonelyplanetkids).